Last December 10, 2015, Best Products of the World, under Home Catalogue Shopping, Inc., presented the winners of the fourth prize campaign in Society Lounge in Makati City, also celebrated their First Anniversary. HCSI’s ambassador, Beauty Queen Alice Dixson, opened the party with a humorous but hearty speech. She said—and she is right—that the awarding ceremony is a time to enjoy and relax. And relax everyone did. Employees from HCSI kept the ball rolling with several raffle draws awarded to friends from the media who were present that night. But the climax was starting to build up. Before revealing the Grand Prize Winner, the company awarded the first two prizes. As an incentive for the so-called early bird order, HCSI awarded Mary Jean Redoña from San Andres, Manila P50,000 for having the earliest order. The second prize, worth P250,000, was given to Manolito Pizon Parame from Caloocan. The first prize worth P1,500,000 went to Priscilla Ursante Yao of Quezon City. 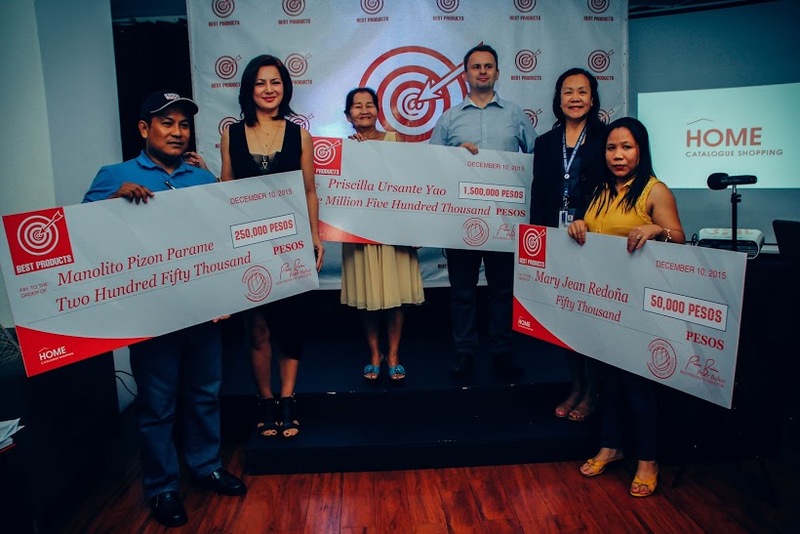 All winners were awarded by Ms. Alice Dixson, DTI Representative Elvira Sagat, and HCSI CEO Cedric De Baets.